Last Saturday was spent largely on the couch. That day, and the way that CJ and I both felt, seemed to become a theme for the week. We both felt <airquotes>better</airquotes> when Monday rolled around but then as the week progressed, I just felt myself getting less energetic and more tired, lethargic and achy. Wednesday night, CJ and I agreed that snuggle time was in order after we got home from band practice. It was around 8:00. Roughly five minutes later, I was dozing on his arm. I woke myself up long enough to make sure he got into bed and promptly jumped back on the couch. Thursday and Friday were more of the same, except sadly, a dull migraine arrived as well and I was out of pills. So, I ordered up some pills and prayed for the best. I don’t get migraines as often anymore (thank goodness), but I’ve had them long enough to know that if I can get my prescription downed in time that, after roughly an hour of complete loopiness and nausea, I’ll feel better. Friday I was heading progressively downhill and decided that CJ’s carnival at school was not in the cards. I was bummed, but I knew that standing in enclosed spaces with screaming, happy children might not make my head feel much better. Now? Well, by now I just feel officially lazy. I’m tired of laying around and not feeling up to doing much of anything. I got out a bit yesterday but the dull headache just went with me and by the end of the day I was in a heap on the couch (again). As I sat down to write tonight, I thought about how piddly this all sounds. I’ve dealt with a respiratory/headache thing for a week or so now, but there are others dealing with so much worse. Some people live with significantly more than this pain I’m whining about day in and day out. I guess I just needed to let you, my dear readers, know why it’s been quiet over here but I guess I also needed the healthy dose of perspective. That should serve to cure any of my dull aches. 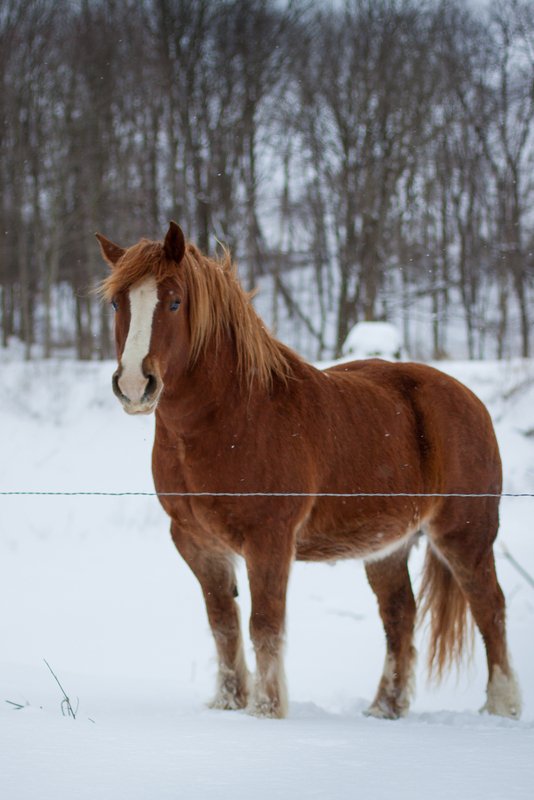 On a brighter (more random and unrelated) note, don’t you just love how beautiful horses are, especially in the winter? Such a perfect display of grace and strength. This entry was posted in Uncategorized and tagged migraines are the devil, random, seasons, sick by staci. Bookmark the permalink.